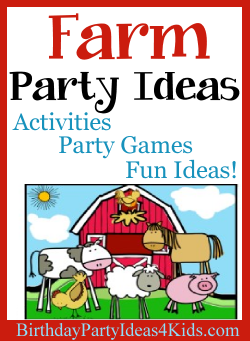 Farm theme birthday party - ideas for a fun Farm themed birthday party for kids including ideas for Farm themed invitations, decorations, activities, games, favors and more. Cow Cards - White cards with black cow spots - either color the spots on the cards or cut out pieces of scrapbook or farm themed paper and glue them onto the front. Animal Cracker Boxes - On large labels print out party information. Then stick them on the animal cracker boxes. Barn Cards - Note cards or invitations with a barn picture - embellish by gluing small bits of raffia (hay) on the front. Put a few straws of hay inside the invitations. Bandana Style - Send invitations wrapped up in blue or red bandanas and ask guests to wear them to the party. Put hay bales in the yard and scatter hay on the driveway. Red table cloths with bunches of yellow and white helium balloons. Tie the helium balloons to toy tractors, hay bales or small wheelbarrows to hold them in place. White vases or milk bottles filled with large yellow sunflowers - tie a red or blue bandana around the vase for a bow. A fun idea for white balloons is to draw cow shaped black spots onto white balloons. Use red and blue bandana's for placemats. Use a wagon that is pulled by tractor or horse or make a smaller version with a wheelbarrow or wagon. Fill with fresh hay kids can have rides two or three at a time. Use a wagon that is pulled by tractor or horse or make your own hayride from a large wagon or wheelbarrow filled with hay and give the guests rides one or two at a time. 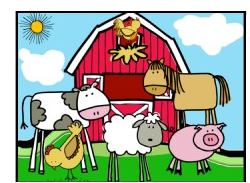 Look for a local company that will bring out chickens, goats, donkeys, horses and other farm animals. Make Mop Horses - Fun craft for children that they can take home as a party favor. You will need new string mops from the dollar store, a package of men's tube socks, yarn in black, brown and tan, felt and buttons, rope or twine. Directions: Place a tube sock over the strings of the string mop to form the head of the horse and then tie the sock to the stick with rope or twine. Cut out 3 - 4" lengths of yarn for the children to glue onto the horses head to make a mane. Cut out eyes, noses and ears from felt and glue them on the head. (You can also sew buttons on for the eyes). This is a fun relay race. Children race against another team to see who can dress like a farmer first. Before the party gather these items - two of each: large size overalls, work or cowboy boots, cowboy hat, sunglasses, bandana, work gloves. Make 2 even piles of the items and place a cone or object so the children will know where they have to go. Divide children into 2 teams and have them line up a good distance away form the piles of farmer items. One by one a member of each team will race to the pile of clothes, put them on and then race back to their line. They will then take the items off and give them to the next person in line. That person will take the items and run to the cone, put on the clothes and then run back to the line to tag the next person. The first team with all member completing the relay wins. Help the farmer water the crops! Two teams race to water their crops first. The guests need to fill up their milk jug so they can give the water to the farmer. Set the empty milk jugs near the teams. Set up a large water container across the yard and have them run back and forth with a spoon or sponge filling up the jug one at a time. Use the mop horses from the Mop Horse Activity (directions under Farm party activities) and have Mop Horse Relays. Set up cones or other farm themed objects that they will have to ride their horses around. Play the classic children's game duck, duck, goose.